Just in case our fears were realized, Lily befriended him counseled him, really to make sure he understood the consequences of agreeing to father a merchild: namely, the need to raise it for a year and then return the baby, without argument, as soon as it was walking. Lily didn't want her family history to repeat itself. None of us wanted that. "I don't need my past," he said. "I want you. You are my future. It's you who makes me happy." "But that's just it," I said. "Don't you see? Your happiness should not be completely dependent on me. You're not whole. Not yet." 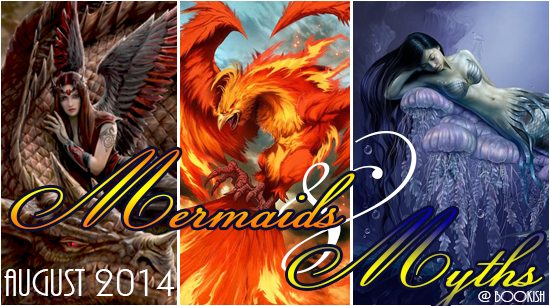 I read the first two books in this series for Mermaids & Myths month last year. I had, had them on my shelf since their releases, but never got to them until then. What I experienced was once again a Mermaid book with something different to offer. I also loved that they weren't sunshine and rainbow Mermaids, they were killers. They were killers that sustained themselves on human emotions, and that made them top of the food chain. Anne Greenwood Brown had me right there and then, and picking up this book I was worried about saying goodbye. What I did learn in finishing this one was that sometimes goodbye isn't bad, sometimes goodbye means letting go in order to finish everything up. There was some many forces at work in this book. This being said, that is because there was much to tie up and only 320 pages to do it in. There were parts that broke my heart, some that shocked me and in the end I was happy that I had felt all of those things. I believe that a last in the series should bring up emotion, you should be connected enough to the characters to care what happens. With everything that was happening I found that this was a quick read, and I enjoyed the pace that was set out. The pacing was not quick, but it was set well enough that you didn't want to stop and you didn't miss anything important. As always the places came to life and I loved my trip into Lily and Calder's world, even if I didn't always like what they were doing. Normally I just love Lily, but some of her decisions in this one rubbed me the wrong way. She was rationalizing things that made no sense, and letting bad judgement get the best of her. This is not to say that I stopped loving her, but I did have higher hopes for her after the two previous books. Lily made many mistakes and placed her trust where she should have known better, but she also did many things out of love. Her love for her family and everyone around her that she cared about. That is one of the things that I have always loved about her, her ability to think of others and not always just herself. However, she also made some slip ups but I tried to remind myself that she was new to this game. Overall, Lily is a great character and even if I will miss her, I feel her story ended the way it should. The romance with Calder in this one was more about him becoming his own person, without using Lily as a crutch. Not that I am belittling his love for her, or what she seems to do for him. More I am applauding him for starting to figure his own things out. Not that the way that it all came about in a way that I liked, but everything has to happen somehow. Calder was also still himself, but a little more irritable. He does slip up, and he does do things that make me want to slap him and yet he is still the Calder I love. I did miss a lot of his and Lily's relationship but the lack of gave way to other things, allowed more to happen. Promise Bound was every bit the book that I wanted it to be, even when it was making me angry. I believe that everything that needed tying up was, and that it was done in such a way that you weren't left wondering. Originally I didn't see how this could be accomplished because of how much there seemed to be, but Brown spent time planting seeds throughout the previous books that made it easier in this one. I look forward to reading more from this author and thought I will miss these characters I expect I will love whatever comes next. If you have read the previous books this one is a must read and if you have yet to pick up the series, you should give it a go, you wont regret it!